Note: Click on the thumbnails for larger versions. 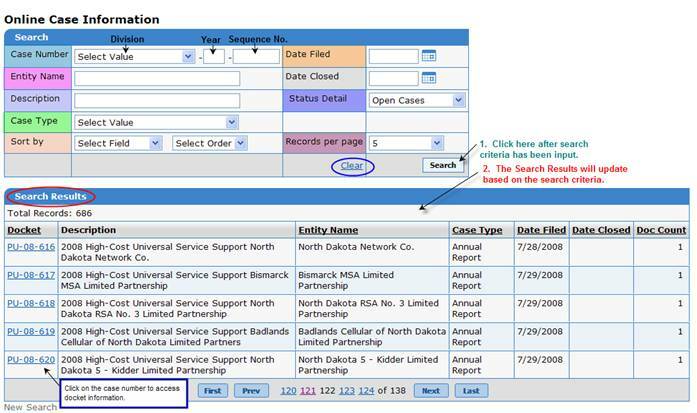 Welcome to the North Dakota Public Service Commission Online Case Search where case information from 2000 to present is available with just a few clicks. Use the back button on your browser to move to a previous window. When initially accessed, the Search Results area contains all of the Commission's open cases. After inputting your search criteria, click on Search. To clear the search criteria previously input, click Clear; this will erase the previous search data, but will not bring you back to the starting screen. To return to the starting screen, click New Search. For assistance, please contact us at 701-328-2400 and ndpsc@nd.gov. There are numerous search options available including Case Number, Entity Name, Case Description, and Case Type. Use Entity Name when looking for cases initiated by a specific company. Search the case descriptions using the Description field. Both the Entity Name and Description fields are wildcard searchable; therefore, the inquiry doesn't need to be an exact match of our information. Use the drop down to search by Case Type. Date Filed and Date Closed are also search options. To return to search 'All Cases', choose the Select Value option. This screen also provides the capability to choose various sort orders and also designate the number of records per page. Click Search to begin the process. The Search Results will update based on the search criteria. Click on the case number to access docket information. 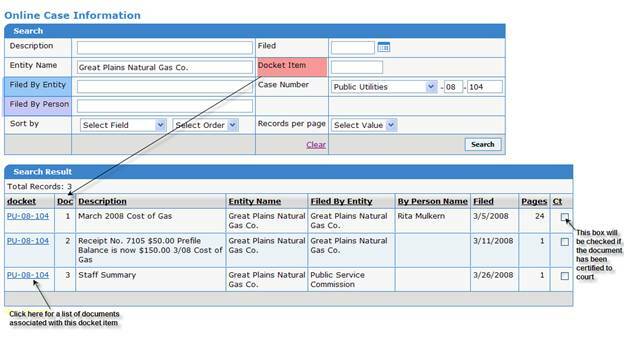 After clicking on the case number, the docket card for the case will appear along with additional search criteria including Filed By Entity, Filed By Person, and Docket Item. To see the document list associated with the docket item, click on the case number under the docket column. After clicking on the case number, a list of documents will appear. Click on the name in the file description column to access the document. The Public Access column indicates whether or not the document is available for web download. This document is not available through the Internet. Please contact the North Dakota Public Service Commission at ndpsc@nd.gov or 701-328-2400 if you need a copy. Thank you for visiting our Online Case Information. If you need further assistance, please call 701-328-2400 or email ndpsc@nd.gov.